CANE TOADS AT THE VICTORIA RIVER ROADHOUSE!! Birds of prey ‘dropping’ out of the skies near Timber Creek! A commercial crocodile farm in Timber Creek is killing cane toads by hand and the WA government is advising the community that their trapping is not ‘catching’ cane toads in this area! A local Aboriginal community near Timber Creek saying that, “… the ‘lizards’ are no longer there in the numbers they used to be a year ago!” The message is clear! Cane Toads are closer to the Western Australian border than official recognition would have them. Appalled with bureaucratic inertia, East Kimberley community members have seized the initiative in the battle against advancing cane toads by organizing their own volunteer training exercise to train community leaders in stopping the noxious pests, and raising support from their local community and local government, for this exercise. “The cane toad will devastate the East Kimberley fauna ”, advised Dr Andrew Story, an ecologist based at the University of Western Australia . “The cane toad will further breakdown traditional aboriginal life,” bemoans Juju Wilson, aboriginal elder of Mirriuwong. “We will miss a lot of animals up here”, John Drill, aboriginal leader of Gija. Kununurra community groups assisted by the NT community group, Northern Frogwatch , and the owners of the Victoria River Roadhouse, will train volunteers at the Roadhouse this weekend 10 - 11 September in how to recognise and net the poisonous cane toad spawn and trap the adult toads. “ …trappers and fencers have probably got a better chance of slowing them down at the moment, than we have…”, Dr Tony Robinson, CSIRO senior scientist working on the CSIRO cane toad project talking to Lawson on ABC Regional NW Morning Program 16 August 2005. “Community Groups are way ahead of the government agencies”’ announced world renowned author Tim Winton, at the recent Cane Toad forum organised and hosted in Kununurra by Kimberley Specialists in Research. “Community activism is an inspiration”, announced Malcolm Douglas of the Broome Crocodile Farm at the Cane Toad Forum. “If we can put up a rabbit proof fence to stop the rabbits, build a water pipe line from Perth to Kalgoorlie, free East Timor, why aren’t clever enough to fence off, trap and defeat the cane toad?” questioned this weekend’s organiser, Lee Scott-Virtue of Kimberley Specialists in Research..
Cane toads have spread from Queensland through the Northern Territory and are marshalling their numbers on the eastern banks of the Victoria River , poised for the move into Western Australia . 70 years after the introduction of the cane toad into Queensland we (the Kimberley community) are now faced with the fact that this season’s wet season could carry them, and their spawn, from the Victoria River into Kununurra and the East Kimberley . “Bureaucratic inertia is just frightening,” said Lee. “If a complex well resourced armed human force on a broad front was invading us, we could and would resist it. The East Kimberley needs the mobilisation expertise of the army. The army owns the land that was formerly Bradshaw Station and this land is on the east of the Victoria River within the cane toad front. Why can’t the army help us? We have written to the Minister for the Defence Forces but as yet have no answer, ” says Dean Goodgame, also of Kimberley Specialists in Research. “Urgent and significant Federal Government intervention is needed immediately to assist the under-resourced and under-funded Kununurra and Northern Territory community groups who are giving this crisis the on the ground urgent attention it deserves. We need to protect indigenous ways of life, our economy, society and our biodiversity,” said Sarah Brett, Kununurra based veterinary surgeon and organiser of Kununurra Animal Wildlife Rescue. “The Kununurra community needs to know where the cane toad fronts are and must be given all necessary permissions to enter these NT lands. We would like to train volunteer leaders to move small volunteer groups into area that have a cane toad problem. With training from people such as Graeme Sawyer, Northern Frogwatch and people from the NT National Parks and Wildlife, we (the Kununurra Community) could mobilise 100s of volunteers and resources ready for trapping and netting. It is anticipated that volunteer groups lead by ‘experienced’ leaders could basically be on call to assist land owners and government agencies in the Northern Territory and Western Australia to ‘stop’ cane toads from crossing over the Western Australian border . The WA Department of Agriculture has mapped part of the front and this information needs to be urgently released to the community. The rest of the front mapping must be done now as the highest priority. Fully funded project officers, on the ground in the Northern Territory , working out of Kununurra, Timber Creek,, are desperately needed. “Paid coordinators for the community groups are also desperately needed” , says Lee. 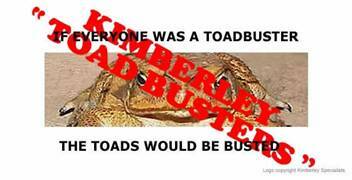 “Having a WA Agricultural border check point to prevent the introduction of invasive species into the Kimberley such as the cane toad at the WA border is not the answer! People seeking to avoid such inspection will simply use other road access points into WA from the Northern Territory . The Duncan and the Buntine Highways are some of the road access points that will help to facitiate the movemenet of hitchhikers into the Kimberley . “The Buntine Highway has access onto the Duncan and then into Halls Creek and is well within the cane toad front ” says Lee. “Finger pointing and jurisdictional control issues across the Northern Territory and Western Australian borders are fuelling Government inertia. The Northern Territory has the toads and the front that is moving towards Western Australia . The WA Department of CALM and the NT National Parks and Wildlife are dancing around each other’s territory carefully, but the issue is urgent and requires cooperation as a matter of urgency to get the traps on the ground in the NT NOW in order to control and contain the cane toad front east of the Victoria River. The toads do not recognise political boundaries ,” says Sandra Boulter, solicitor specialising in environmental law, and volunteer based in Kununurra for Kimberley Specialists in Research. Waterways and dependent ecosystems of the vital Victoria , Baines and Keep Rivers , and the Negroid and Bullo Rivers (many of which feed into the Ord River and Lake Argyle catchments). “ Northern Territory community concerns have been voiced since the early 1990s and no traction could be found with government agencies or media ”, despaired Graham Sawyer of Northern Frogwatch based in the Northern Territory and responsible for trapping cane toad populations already in Darwin . “ That traction now finally seems to be happening in Western Australia with the activism of the Kununurra based community groups,” said Graham. “The CSIRO gave us the cane toad 70 years ago. While they are working on a biological control, said to be at least 10 years away, they must shoulder some of the responsibility and help us push back and resist the eastern front with physical means. The loss of biodiversity through waiting around until after the onset of the upcoming wet season will be catastrophic,” says Lee. “It isn’t a lost cause. With cooperation from all parties and urgent ON GROUND ACTION IN THE NORTHERN TERRITORY and sufficient funding commitment from Governments to support the on ground action, the battle can be won,” said Lee. “Bureaucratic fatalism about our ability to resist the cane toad is flawed”, she added. And the Kununurra and East Kimberley Community.